Tracks and CD as standard version. 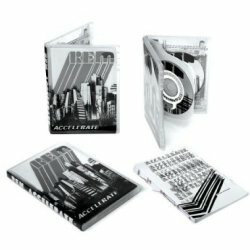 Includes DVD video with 45-minute film called 6 Days, a fly-on-the-wall style art film about the making of Accelerate. The film includes the studio recording process and some footage from the Olympia Theatre in Dublin, July 2007. DVD also includes Supernatural Superserious b-side tracks Read Head Walking and Airliner, also as mp3 files. Product ID: 9362-49877-2-7..